Look out tennis parents and kids. There is a new contender for U.S. Open honors. He is the star of two picture books by Maura Moynihan, a Florida-based tennis instructor. And talk about growing the game … he is a bear with a parrot pal. 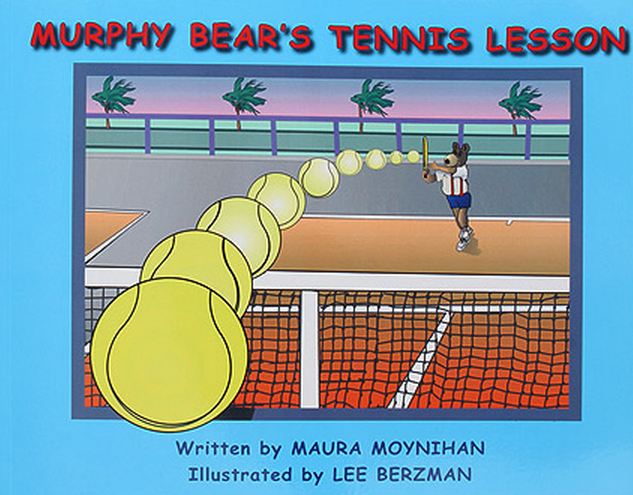 In Murphy Bear's Tennis Lesson, the title character discovers how much fun tennis is as he goes through the stages of learning the grips and the shots. It is true that a bear, being so big and strong, might be at a disadvantage in a long, three-set match, but at least Murphy Bear doesn't have to drag a long tail around the court as does his alligator practice partner. In Moynihan's second book, Murphy's name changes to Murphfit, but he is the same tennis-loving bear. In this book, Murphfit goes to the U.S. Open. At the National Tennis Center, he goes to Arthur Ashe Kids Day and the Smash Zone, but his biggest surprise comes when his Florida pal, a parrot, also shows up at the Open. Murphfit Bear Visits the U.S. Open combines some basic instruction in QuickStart progressions alongside the story of a tennis playing bear's first trip to New York. Ms. Moynihan will be at Arthur Ashe Kids' Day to introduce Murphfit and her other characters to kids and parents.